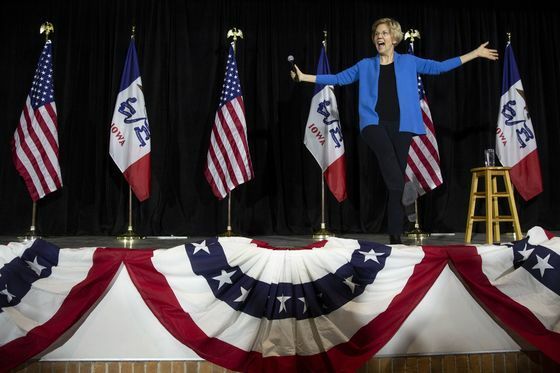 (Bloomberg) -- Senator Elizabeth Warren made it official on Saturday: She’s running for president to change a country she says is “rigged by the wealthy.” She quickly drew the attention of President Donald Trump’s re-election campaign. Trump sent a tweet later in the day that referred to Warren by the “Pocahontas” nickname he uses for her. The president also appeared to make a joking reference to the “Trail of Tears,” the route along which the federal government forced thousands of Native Americans to migrate from the Southeast to reservations in the western U.S. in the 19th century. Warren, who has used a DNA test to prove she’s part Native American, recently apologized to the Cherokee Nation for the action and has called the nickname by the president a slur. The senator was introduced on Saturday by Representative Joe Kennedy III, grandson of former U.S. Attorney General Robert F. Kennedy and part of the new generation of the most prominent Democratic family in Massachusetts and arguably the U.S. She also got the backing of the state’s other senator, Democrat Edward Markey.